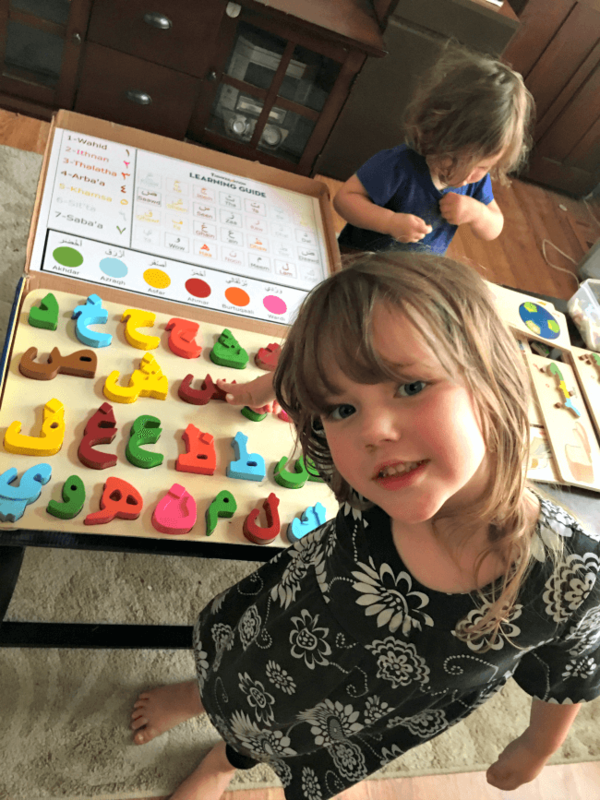 English letter learning: Melissa and Doug puzzles, magnetic letters, fuzzy letter boards, and puzzles. Arabic letter learning: Worksheets, workbooks, YouTube videos, and more worksheets. 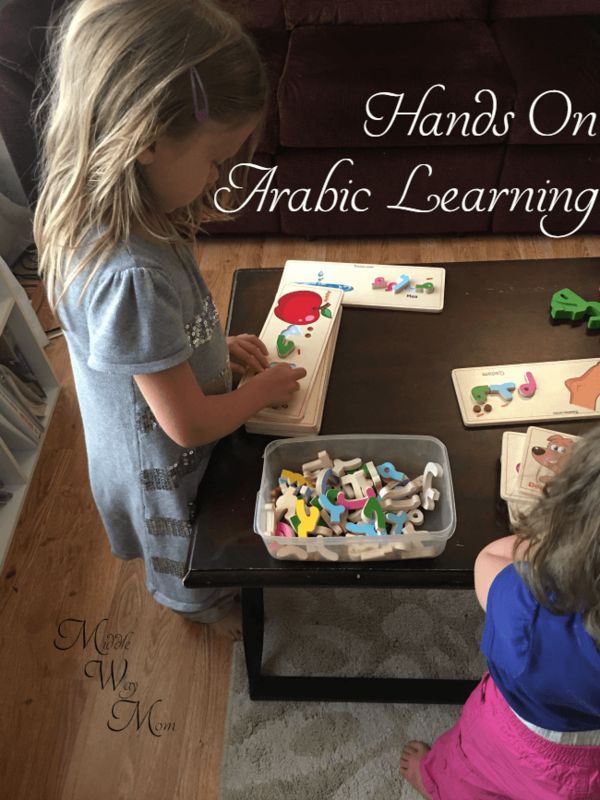 Arabic language learning does not have to be confined to worksheets! We are in the beginning of our Arabic learning journey. As you may know, I’m personally studying Arabic through Studio Arabiya, but I have not signed up my kids. I know that if I assign that out that I will take the responsibility less seriously. Since I’m taking this weight of Arabic learning on my shoulders, I am constantly on the look out for resources to help us learn Arabic. I’ve learned that raising bilingual kids is beneficial in their reading abilities, linguistic awareness, and print awareness. But how do you start with your child to learn a new language you don’t know? Toys, and occasionally videos, but toys are best as they can be enjoyed without limit. I do believe that the more exposure my kids have, the quicker they will learn and the deeper it will be in their memory, but I don’t believe that any old resource will do. I’m careful with how we spend our homeschooling dollars, and I don’t want to buy something I’m not completely sure I will use. So, our Arabic learning section of our home book and game library is sparse. This post is a review of Thinkernation puzzles and I have been compensated for my time to compile the review. As always, all opinions are my own. I was given the opportunity to review Thinkernation’s puzzles, and I was excited, to say the least. Online, these puzzles looked amazing, but in person? They are second to none! First, let me introduce you to the Arabic letter puzzle. It’s Montessori-style in that the pieces can only fit in the correct, alphabetical spot. They are thick and well crafted, and I’m particularly happy that all the dots come attached. Any puzzle made for little kids that doesn’t have the dots attached is out in my book. Getting to touch and manipulate the order of the letters is valuable in introducing or cementing the knowledge of the letters. In addition, the back of the board is a chalkboard! You can flip the puzzle over and practice writing with chalk, copying the puzzle piece! Even the cardboard box it comes in includes labels with Arabic colors, numbers, and transliteration of the Arabic letter names (see picture below). My 6.5 year old is still learning the alphabet, and just like learning how to spell and read in the English language (which she is still working on, too), remembering all the sounds associated with all the letters takes time. Sometimes a lot of time. 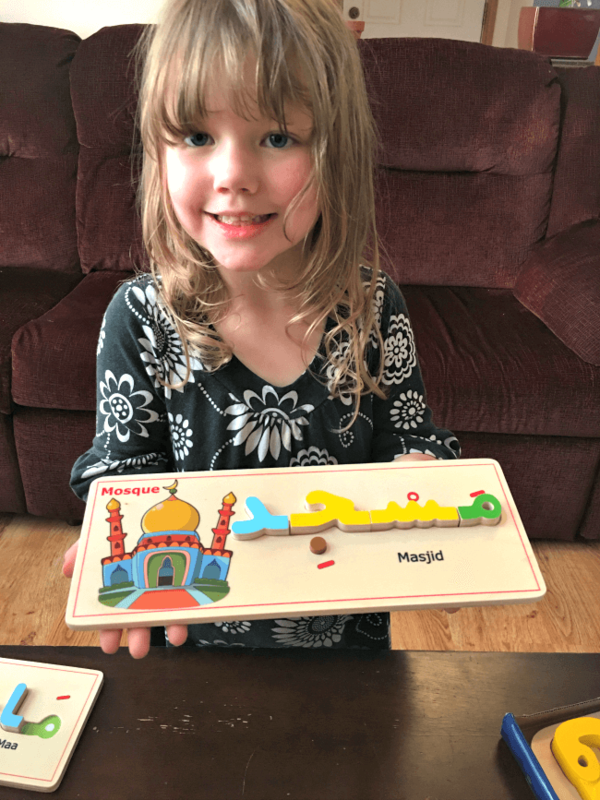 One thing we have been doing is introducing words can use in everyday conversation like “please,” “thank you,” “pen,” “book,” and “I want.” I love that using this puzzle alongside her vocabulary words, she can practice seeing the word in the Arabic language. Just knowing what a word sounds like, and seeing it printed opens the door to kids decoding the symbols they see and moving toward reading. I also love how seamlessly using these spelling puzzles opened up for the conversation about how Arabic letters look different depending on where they are located within a word. We have months before we reach that level in our Arabic curriculum, but we naturally talked about it as we are working hand-on with Arabic words, mashaAllah. With the alphabet puzzle, by far my favorite feature is how sturdy it is. Honestly, when I got the box in the mail, I was confused what in the world was being delivered that was so large! (Now that I’m talking it up, maybe you won’t be as shocked as I was, but I didn’t know!) Each piece is solid wood and will last for generations, I’m sure. Second, I love the box it came in with all the additional information on the inside. It’s these additional touches that make it stand out from the crowd. The chalkboard back is a definite bonus! As for the spelling puzzles, I love how the letters are different colors based on whether the letter is at the beginning, middle, end, or alone. Again, this opens the discussion about the letter’s various forms. Also, each board has a word on each side, so the wood is used to its full potential, making my eco-friendly heart happy. All in all, I don’t know what else I could ask for. I just hope they make more spelling boards that we could buy as our kids master the first set! Want to keep up with what Thinkernation is doing? Connect with them on Facebook or Instagram! Which puzzle will you be buying for your kids? Thank you so much for sharing your experience. I want to learn your idea about starting with which language. For example, I am Turkish. We all talk in Turkish. My daughter also speaks Turkish very fluently. But we live in USA. She should learn speaking and reading English. Now she knows nothing about English. And I want to teach her Arabic too. From where should I start? Turkish reading or English speaking and reading or Arabic? I wish I could help, but with me not even being bilingual, I don’t know that I would have valuable advice. My guess would be to expose her to all three as best you can. I’ve heard it goes slowly when you do three, but at some point it all just clicks, but again I don’t have personal experience with that.